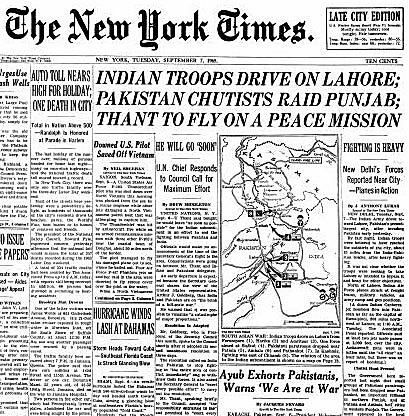 The Sept. 7, 1965 front page of The New York Times was aflame with reports if the second war over Kashmir. In 1965, India and Pakistan fought their second of three major wars since 1947 over Kashmir. The United States was largely to blame for setting the stage for war. The United States in the 1960s was an arms supplier to both India and Pakistan--under the condition that neither side would use the weapons to fight each other. The weapons were ostensibly designed to counter communist China's influence in the region. The condition, imposed by the Kennedy and Johnson administrations, was a naive reflection of American misunderstandings that would plague American policy there for decades. Had the United States not supplied either sides with tanks and jets, fighting would likely not have resulted, as Pakistan would not have had the air power to take on the Indian military, which was eight times the size of Pakistan's. (India had 867,000 men under arms at the time, Pakistan just 101,000). Pakistan, however, allied itself in 1954 with the United States through the Southeast Asia Treaty Organization, leading neutralist India to accuse Pakistan of positioning itself for an American-backed attack. U.S. arms supplies in the 1960s fed the fears. "We warned our friends that this aid would not be used against China, but against Pakistan," Pakistani President Ayub Khan, who ruled Pakistan from 1958 to 1969, complained in September 1965 of American arms flowing to India, too. Ayud, of course, was being brazenly hypocritical as he had also dispatched American-made fighter jets against Indian forces in Kashmir. The second war over Kashmir, never declared, broke out on Aug. 15, 1965 and lasted until a UN-brokered cease-fire on Sept. 22. The war was inconclusive, costing the two sides a combined 7,000 casualties but gaining them little. According to the U.S. Library of Congress' Country Studies on Pakistan, "Each side held prisoners and some territory belonging to the other. Losses were relatively heavy--on the Pakistani side, twenty aircraft, 200 tanks, and 3,800 troops. Pakistan's army had been able to withstand Indian pressure, but a continuation of the fighting would only have led to further losses and ultimate defeat for Pakistan. Most Pakistanis, schooled in the belief of their own martial prowess, refused to accept the possibility of their country's military defeat by 'Hindu India' and were, instead, quick to blame their failure to attain their military aims on what they considered to be the ineptitude of Ayub Khan and his government." India and Pakistan agreed to a cease-fire on Sept. 22, though not without Pakistan's Zulikfar Ali Bhutto, the foreign minister at the time, threatening that Pakistan would leave the United Nations if the Kashmir situation wasn't settled. His ultimatum carried no timetable. Bhutto called India "a great monster, a great aggressor." The cease-fire was not substantial beyond a demand that both sides put down their arms and a pledge to send international observers to Kashmir. Pakistan renewed its call for a referendum by Kashmir's mostly Muslim population of 5 million to decide the region's future, in accordance with a 1949 UN resolution. India continued to resist conducting such a plebiscite. The 1965 war, in sum, settled nothing and merely put off future conflicts.